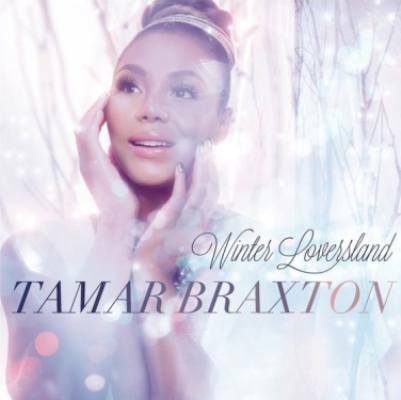 Tamar Braxton | Winter Loversland - TheUrbanMusicScene.com | Music Reviews! Is Tamar Braxton finally winning at this game of music? On the surface it would seem so. Nearly a year ago her single “Love And War” was released and by August 2013, it sold over one million copies. The September release of her album of the same name has already generated three official singles, as well as the recent release of the video for one of the project’s weaker tracks (but one of Tamar’s favorites) “Hot Sugar”. And on December 1st, fans will see the youngest Braxton sister emerge as one of the night’s big winners at the Soul Train Music Awards which taped a few days ago. So one may wonder why is she releasing a new project only two months after her last release? Perhaps Tamar is concerned about the public’s waning attention span or the 13 years it took to release her sophomore album, but she is wasting no time in offering us her first holiday project, WINTER LOVERSLAND. Like LOVE AND WAR, this seasonal collection of tunes is one part vocal brilliance and one part random filler. The focus of this album isn’t to fill you with the holiday spirit but to remind you once again that Tamar can really sing. Ironically, on that point is where the project both fails and succeeds. On the opening track, a brief rendition of “Sleigh Ride”, we’re introduced to the main nemesis of this album: oversinging. Like your favorite eggnog this tune is best served straight up, no ice. However, Tamar gives it a few extra runs throughout which would be fine if they didn’t interfere with her breath control and phrasing. The same crime is committed on the next offering, “Santa Baby”, originally recorded by Eartha Kitt. Kitt, who was not necessarily regarded as a strong vocalist, was able to convey the tune’s playful emotion. Tamar opts for a few vocal acrobatics which not only seem unnecessary but gives us none of the song’s tongue-in-cheek humor. “Extra” vocalizing also steals some of the joy from “Santa Claus Is Coming To Town”, which additionally suffers from a low-rent production back beat. The album shines brightest on its two original ballads, both co-written by Tamar and sonically speaking could have fit in nicely on her R&B effort. “No Gift” sees the gifted vocalist exploring the deeper tones of her instrument, recalling the artistry of big sister Toni. However, by midpoint into the tune she is in full Tamar head voice and there is a lovely, albeit brief, piano/vocal interplay at the close. “She Can Have You” is a more straight-forward R&B sound. A dramatic heartbreak tune that barely mentions Christmas, it will leave the listener quickly forgetting its holiday connection. Tamar gives a stunning vocal however, which demonstrates how powerful she can be when she digs in and reaches for the emotion and not just the big booming notes. The remainder of the album is more of that same back and forth when the over-the-top vocals either work very well or seem very gimmicky. I get a personal chuckle when people scream on “Silent Night” as Tamar does here. But one can’t deny the harmonizing perfection with sister Trina, even on a goofy song like “The Chipmunk Song”. The album ends on a high note, literally, at the conclusion of “Have Yourself A Merry Little Christmas”. WINTER LOVERSLAND may not inspire you to sit cookies and milk out for Santa but by the end of it you will get a very good idea of how many vocal backflips Tamar can do.